On Thursday I sat in the screening room at London's Mayfair Hotel sitting comfortably and stuffing my face with toffee popcorn. I was there for ITV's X Factor launch. I had already accidentally bumped into half of the judging panel coming in and out of lifts but now I was sat in my seat ready to see excerpts from the weekend's episodes. If like me you are slightly sceptical about the return of ITV's landmark music talent show over the weekend then I've put together a list of the changes the savvy producers at Syco and ITV have come up with to hook us all in again between now and Christmas. 1) Sharon's back! I'll admit that statement didn't have me initially jumping for joy but actually it's nice to have Mrs O back in her chair on the judging panel as she brings a certain element of fun and humour to proceedings. Louis Walsh announced he was leaving at the end of the series, however when asked about his decision he said, "10 years on a show is a long time but we're having a great time this year so I might come back if I'm asked"
2) The audition rooms are back! Again, not a statement that I was keen on when it was revealed earlier in the year, but I found myself drawn to the intimacy that just a singer in front of judges brings. I found I actually preferred that to the arena setting that we've been used to over the past few years. The judges seem more relaxed and are able to be more constructive with their comments without being swayed by an overenthusiastic crowd willing them on. 3) Outside the audition rooms where Dermot stands with the contestant's friends and family there are screens into the audition rooms. This means that everyone waiting to audition can also see what's going on in the audition room and it makes for some interesting scenes. 4) Fil Henley (Phil with an F) is a rocker with a packed lunch! One of the funniest moments of the opening episode on Saturday that doesn't deserve spoiling. 5) The banter between the judges. At least at the early stage the foursome seem to be having a genuinely good time on the panel. I think Mrs O brings an infectious sense of fun that Gary, Louis and Nicole seem to have embraced. Osbourne was quick to put to bed any thoughts of their being a head judge this year. "People find this hard to take, because it has become a sort of pantomime – who is the baddie, who is the goodie – and that’s all old crap. That was yesterday. That’s like old cheese." 6) The arena shows. If I'm honest the arena auditions felt like they packed less punch this time round. Because the judges put through the best people from the intimate room setting, the arena audition felt a little surplus to requirements. It lacked the excitement and unpredictably we've seen in previous years but this all based on highlights of the weekend's offering so that might change. 7) The bootcamp changes. The new "six white chairs on the stage" element to spice up bootcamp. It's a clever and interesting new twist. The judges are forced to pick their final six live in front of an arena audience and fill six chairs. However, no one is safe until everyone in the category has sung, meaning that your seat isn't secure and if a judge thinks the person next has sung better they'll get the seat. It was cleverly teased as "The Ultimate Game of Musical Chairs." 8) Whatever you think of the X Factor, it is the superior Saturday night entertainment show. And God knows we've been exposed to some utter tripe from all sides of the remote on Saturday nights since it came to an end last year. The changes make it a feel fresher, Sharon's return is a welcome one and after a ropey and unexciting last couple of years I'm well and truly looking forward to the weekends again. 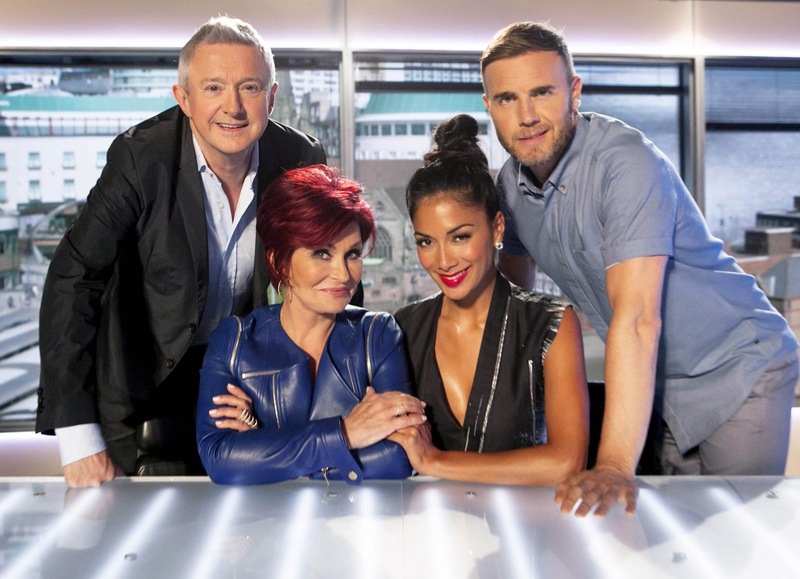 X Factor series 10 begins Saturday 31st August at 8.00pm on ITV with the audition rooms at 8.00pm on Sunday.